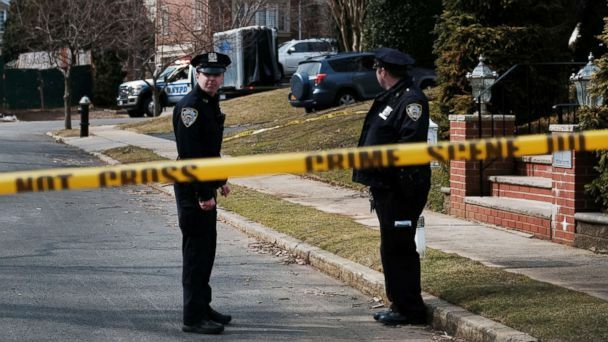 Moments before a reputed mob boss was gunned down in front of his Staten Island, New York, home on Wednesday night, the alleged killer lured the unsuspecting man outside by crashing into his parked car, multiple police sources told ABC News. The unidentified hit man drove to Francesco "Franky Boy" Cali's Todt Hill house and came to a stop. Law enforcement sources told ABC News that the driver put his vehicle in reverse and crashed into Cali's parked Cadillac SUV - forcing the license plate to fall off Cali's car. Once Cali came outside the home, sources said, video surveillance showed the two men talking and then shaking hands. Sources said Cali, 53, appeared unaware of impending danger because he turned his back on his killer to put the license plate inside the rear of the SUV. That's when the gunman pulled out a 9mm pistol, held it with two hands -- as if he was trained, the sources said - and opened fire. The video is grainy and has not been released because the suspect's face cannot be made out, sources told ABC News. Investigators are continuing to canvass the neighborhood in search of clearer video. Twelve shots were fired and Cali was hit six times, New York Police Department (NYPD) Chief of Detectives Dermot Shea said at a news conference on Thursday. Cali, was taken to Staten Island University North hospital and was pronounced dead less than 40 minutes later, police said. ABC News' Josh Margolin and Mark Crudele also contributed to this report.